Measuring rooms for a decorating project may seem hard, but it’s actually really easy. When you’re planning to decorate a room, it’s important to have the space measured so you can come up with a furniture plan that works. Measuring room size, walls, doors, and windows provides you with the ability to choose items that fit your space well. If you’re only changing bed linens and drapery, of course measuring isn’t necessary, but when assessing a room’s layout and planning for new furniture, artwork, and window furnishings, a floor plan (floor sketch) and wall elevations (wall sketch) are genius tools to help make the rest of the decorating project so much more easier! To measure rooms you’ll need a tape measure, paper, pencil, and someone to help (depending on how big the room is). Roughly sketch the existing layout of the room. This does not have to be perfect. You should include the placement of the windows, doors, closets, built-in lighting fixtures (sconces & ceiling lights), radiators, and electrical and/or cable outlets. Measure each wall from corner to corner and record the measurement on your sketch. Record as feet and inches (5’-6”). For me, it’s easiest to measure when I place the measuring tape on the floor. Measure the ceiling height and label it on the sketch. Then, measure and record the location of each door, window, closet, built-in lighting fixtures, and radiator (if you have one). It may not be necessary to measure the location of the electrical and/or cable fixtures unless you have issues with your outlets being visible. Lightly sketch each wall, including the doors, windows, closets, and radiators. On each wall elevation (wall sketch), measure and record each door from the floor to the top of the door. Windows need to be measured from floor to bottom of window and also from bottom of window to top of window. Make sure you sketch and measure all your trim, too (baseboards, crown moldings, etc.). If the drawing is too messy, you may want to redraw it so it’s clear and easy enough to read when going to stores to look for furnishings. These drawings and measurements will prove super valuable when looking for that perfect size bookshelf to fit in a tight corner. If you’re planning to keep any furniture, I suggest measuring them and noting them somewhere on the outside of your sketches. This helps make sure that any new pieces you get will work with existing furniture. It also helps when you’re trying to create a new furniture layout. I’d also suggest scanning and saving your sketches on your computer for safe keeping and/or viewing on your computer screen. It may seem like a lot to do, but I promise, measuring your room first will make your decorating projects a whole lot easier. With your sketches, you’re able to see how large a wall is, how much space is in between a window and the end of a wall, how high your window is, and more. You’ll now be able to quickly see if that dresser you’ve been eyeing would be too big or too small. That art print on Etsy? You now will know if it’s the right size for the wall space between your two windows. You’ll know where the outlets are located and would easily be able to see how far or near your outlets that your furniture should be. If sketching and measuring rooms still seem too hard, I suggest getting someone to come and do it for you, or even pay a professional. Trust me, it’s worth it, especially for large rooms when you’re starting from scratch. Don’t forget to check out my LOVE YOUR HOME 4-week decorating workshop – measuring will be apart of the workshop! Was this post helpful? 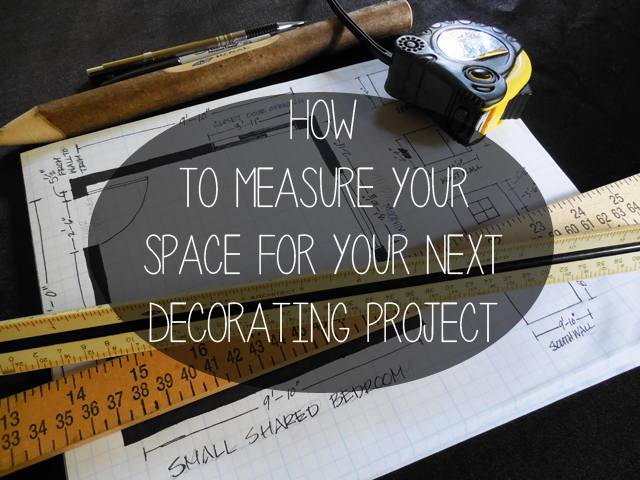 Will you be measuring your rooms for future projects? I want to hear from you, so leave a comment below! This would have been helpful when we redid our living room! I’ll pin this post for when we work on the bedrooms!! Thanks Jamie! Let me know if you have any specific questions, and I’ll help you through it! Lorelai @ Life With Lorelai recently posted…Which Gilmore Girls Character Are You? Thanks Lorelai!!! Scanning your sketches on your computer, let’s you have them for later. So, if you add notes that you don’t need later, you can always print out an extra copy of the sketches that you scanned before adding the notes. No wonder nothing ever works when I try it…I’ve been going about it all wrong! Thank you for this!!! Thanks Kristen! 🙂 I don’t think that there’s a right or wrong way to actually take the measurement, but I do find that this is an easier, more efficient way to get a workable sketch/floor plan. Let me know if you need any help with any of it! I remember in design school being taught this, my dh will not go for it. We shove furniture around and around. Lol, Dawn! I use to do that, too, but trust me, by having a sketch with the measurements on it, you’ll won’t have to move furniture aimlessly around a room again. It reminds me of moving. I always like to measure the whole new place and plan it before the move – it is the fun part. 🙂 Kita, it’s really easy if you have someone to help you! You can even do it in stages. You can do the quick sketch one day. And then start the measuring when you get someone to help you! Thanks for sharing Brittnei! I really appreciate it! I’m glad I could inspire your next project, and you’re right, guessing (and trial & error) could work for small rooms, but larger rooms need a bit more planning. I could tell you from experience, though, that measuring could even same time for your smaller rooms. Another thing you could do is measure ALL your rooms a little at a time when you don’t have decorating plans. This way you can store your sketches for the time when you are ready to decorate. Thanks for stopping by Vanisha! I’m on my way over to yours now! Incredible post!!! You have given your readers great facts on the space measuring. As many people neglect this aspect of measuring and when it comes to store some new things they get into trouble. But your tips gonna really helpful for everyone. I am also inspired by you so much and I will use all your tips in my office decoration project. Great tips! We are doing some redecorating now, so I can definitely use this. Thanks Michelle! Let me know if I can help in any way! I’m on my way to follow your blog now, and check out your blog hop! Thanks for stopping by!